Kibanja registration is a way through which the land lord gets to know seated tenants on his land. This is the first step to Leasing. At this stage, the tenant fills an application form to which he attaches detailed information. Download BLB Client Charter to read more on eligibility. 02 Obtain and fill in Lease Application Forms from any of the Buganda Land Board branch offices. 03 Produce copies of authentic documents that indicate ownership of the piece of land. In case of a company, submit a copy of the Articles & Memorandum of Association plus a certificate of registration. 04 Draw a directional sketch map to your plot/ Kibanja applied for. This should indicate physical features along the route for clear directions to the plot. 05 Produce a photograph of the existing development on the plot. The photograph should be taken with the person applying next to the developments thereon. 06 Attach your passport size photographs on the forms obtained from Buganda Land Board. Inspection of the plot applied for and verification of documents is done at this stage to prove ownership. On completion, Survey of the Kibanja/plot begins. This is the practice of measuring angles and distances on the ground so that they can be accurately plotted on a map. Down load BLB Client charter for more information on survey rates in relation to acreage. 01 The seated tenant gets to be known to the land lord. At this stage the tenant acquires a file registration number e.g. BLB/01/1122, as an identification from which the land lord is able to relate with the tenant. 02 The plot/Kibanja boundaries are clearly identified and mark stones placed. 03 Kibanja registration & survey will prevent potential encroachment. 04 Surveying adds value to land. 05 Surveying is a requirement to a certificate of title. N.B: Premium payable is dependent on size, location and capital value. Download BLB Client Charter for information on assessment of premium, ground rent and title charges. Kibanja Registration and survey processes must have been completed. A commitment on premium i.e. a deposit on premium must have been made. The client is notified to pick agreements for perusal, signing and witnessing. The agreements are signed in duplicate. For Companies/organizations; clients attach certified copies of certificate of incorporation, Memorandum & Articles of Association and company resolution. It is the last stage of the lease process. 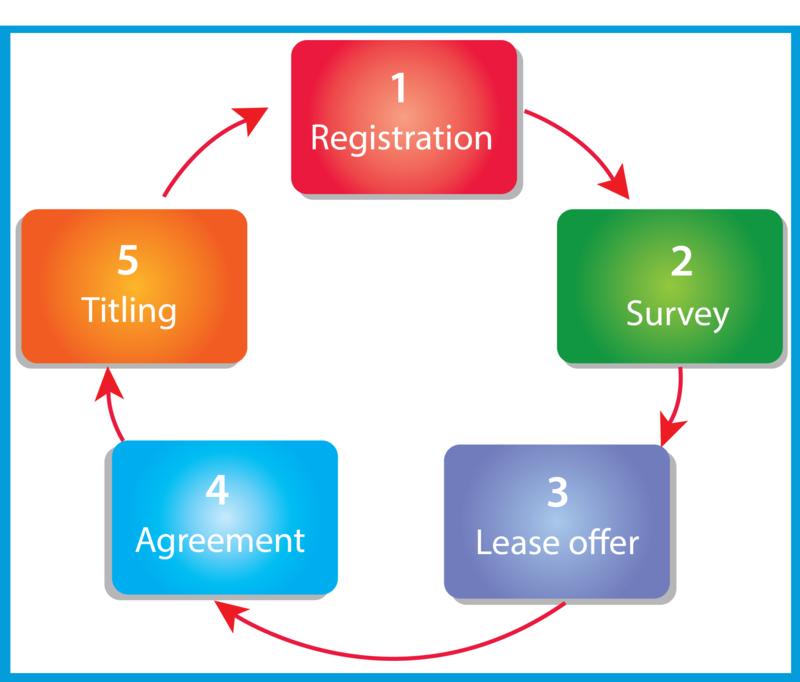 A Lease hold title is processed and handled over to the tenant after submission of the signed agreements.